Joy Wolcott and Natasha Takemoto are not simply designers who love clothes. They love what's underneath the clothes; often literally, when moved by who wears their garments and why, and also in terms of how a particular garment may have come to be. They have a genuine, charming fascination and appreciation for people and personal story. The people who inspire, the people who make, and the people who wear the clothes, whether theirs or pieces by designers they have longtime admired, and they design to inspire as much as they do in reaction to being inspired. In talking about their line, Wolcott : Takemoto, it’s clear that they consider themselves not trendsetters or spearheads in the fashion industry but part of an intertwined community of creators supporting each other and the work. Their timeless, elegant pieces are free from trends and display a quiet confidence even hanging, off-body, on a rack. In partnership since 2011, we’re excited to have finally sat down with them to learn more about their collections. What sparked the desire to collaborate and begin building a business together? Natasha: Joy and I both went to school for fashion - Joy went to school for design and I went to school for product development, so we both moved to New York with hopes of working in the industry. For me, having my own clothing line seemed like a very distant possibility...l have always wanted to do my own thing and to have my own company but it just seemed very unrealistic initially. I feel very lucky that our business has grown so organically. Joy: I think, in retrospect, it was always a subconscious dream - it just took a series of events to reveal it. Meeting Natasha was the moment where my subconscious dream was awoken into a real thing. Her childhood was like my urban counterpart. We were both in this situation where it was easy to feel like we could never make it on our own in the fashion industry because we did not have enough money or any connections. All it took was a conversation to realize that we could combine forces and make our dream happen. Had you both always wanted to create in some way? Was it always fashion/clothing? N: I started with coloring books, moved on to dressing up Barbies, decided to try and play the guitar and piano, and then discovered cross-stitching/knitting/crocheting and sewing. In high school, I used to screen-print band shirts for me and my friends but I didn't think a career in fashion was a real thing until I started working in retail. J: I grew up on a farm in Nebraska with limited access to anything non agricultural related (even the closest grocery store was 30 miles away). The best way for anyone to possibly grasp that experience is to describe it as growing up on the Little House on the Prairie. To this day, the experience still makes it a little hard to relate. I missed out on a lot of pop culture, which was a major influence on a lot of my artistic friends when they were growing up. However, my artistic inspiration is really just a different story. I was still able to develop creative skills - just through a very different outlet. My grandmother was an amazing seamstress and very creative. She was the first person who tapped my creative energy and taught me a lot about imagination and idea. She blew my mind when she taught me to sew at age 5. When I was 8, I began sewing competitively where, each summer, I would make a collection of 10-15 garments. At that age, I just assumed everyone made their clothes and was unaware that I was actively pursuing something very unique. I didn't know people grew up to be clothing designers. It was just something we did to save money. Do you have any creative outlets other than clothing design? N: I still love doing little craft projects at home! I am also getting into gardening, which is not the easiest task when living in a New York apartment. J: I really like to bake but, since living in New York, I haven’t had a real kitchen so that outlet has been put aside. I also really like photography. I've been studying a lot of early 20th century photographers in hopes of adding a new perspective to my own photos. N: Well, I do love to karaoke. J: I took 7 years of piano and 10 years of clarinet lessons. I wish I kept at it because I don't feel confident in either now. But I know how to read music pretty well. We're extremely impressed with your teeny team (just the two of you!) how do you split up the tasks? Do you have any advice on managing such a multi-faceted business in an industry that moves at such a fast pace? N: I feel super fortunate to have Joy! Although it is just the two of us, our past work experiences have really helped us turn into a well-rounded team. Our combined backgrounds in the service industry, e-commerce, retail, design, and styling help us in our business today. That being said, we both multitask A LOT. Joy and I collaborate on the designs and I am more focused on sales, customer service, and our new website! J: We collaborate on the design process - I do most of the sketching but we discuss our ideas together, which leads to more sketching and line development. I also work on more of the technical aspects of sampling and production. I do our pattern making, which I would always like to keep in-house. I find there is a lot of a creative opportunity in this second phase of drafting the designs that helps evolve the pieces. I also really like thinking about new ways to finish seams and hems, so I work really closely with the factory to develop the finished garments. What's your favorite part of it all? Most challenging? N: I love that we are both working for something that is ours. I also am so happy that we get to do our part to help keep the New York Garment District going. Our factory is a very small family-owned factory in midtown and we have become really close with them. I also love that we get to work with our very talented friends. We collaborate often and it's so nice to have a community of people that want to help each other succeed! On the other hand, it can be very challenging as a small and independent business. We‘ve definitely made some mistakes but, on the bright side, we have learned a lot and will continue to learn...which is exciting. J: I love seeing our pieces worn by strangers. You have this idea that you put so much thought and work into and for that idea to be turned into a tangible good that someone else likes and wants to wear is amazing. What’s tough for me is managing the business aspect of things in a way that protects the future of what we're trying to do. We love the Spring and Fall 2016 collections. What's most refreshing is that the clothing is not just beautiful but considered in that it's representative of a bigger picture and story - your heritage and where each of you grew up - how did arrive at the concept? N: We thought it would be cool to really focus on where these two people behind the brand came from to make them the people and designers that they are today. J: We thought it would be fun to do a two-part heritage collection early on in our brand development to help tell the story of who we are. For Spring 2016, we focused on Natasha's Japanese heritage and for Fall 2016, my Nebraskan heritage. It was fun to see which elements made their way into each collection. For spring, Natasha traveled to Japan and gathered inspiration from Japanese artists like Isamu Noguchi and Jiro Yoshihara as well as infrastructure images such as the circle patterns on sidewalks, which lent to the round grommets found throughout the collection. Cultural symbols, such as the shimenawa from shrines, inspired the ropes used as closures and we pulled colors of lilac and red from the Japanese iris and the symbolism of the rising sun. For fall, I pulled inspiration from the fields and pasture landscapes, which led to a strong emphasis on custom-dyed brown denim as well as custom quilting. A lot of the silhouettes are inspired by pieces from childhood and early adolescence. What can we expect from Spring 2017? J: For Spring 2017, we decided to reproduce many of our classics from past collections. It’s something we feel helps to develop our brand image as a timeless collection with pieces that can stay in your closet for more than one season. N: These classics will be offered in new colors, too. I love the new light blue color - it's called Evian! The palette was inspired by objects in our lives and around our studio space. 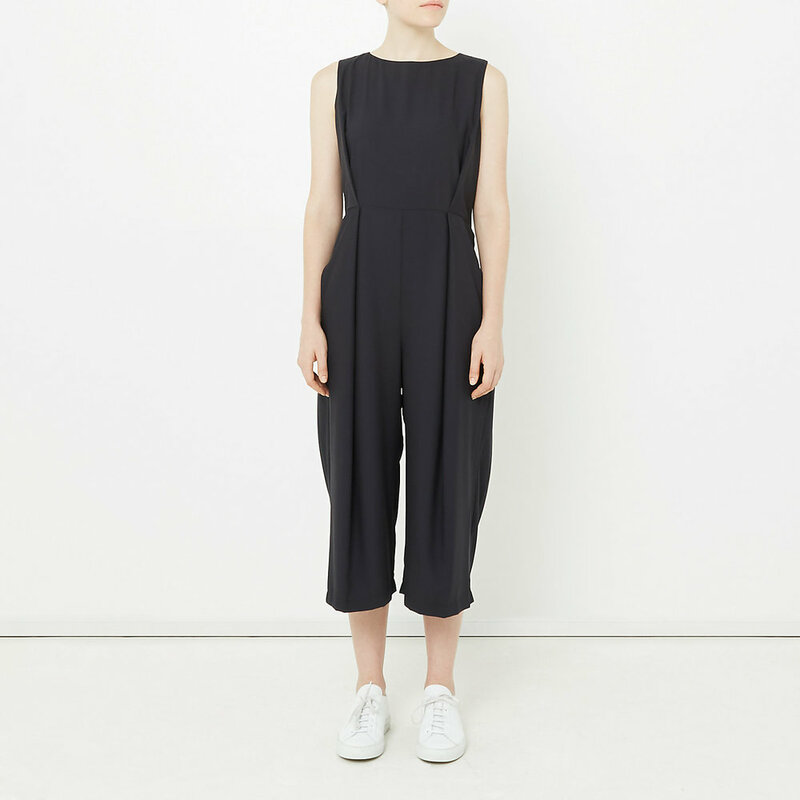 I'm also very excited for the Carol top, which is a play on our Carol jumpsuit, which you guys have for fall. It has a wrap that can be tied front and back or left loose. Are you working any further ahead? N: We are! We’re currently inspired by the surrealist photographer, Shoji Ueda. We were also very moved by the book Sonomama Sonomama by Taishi Hirokawa, another Japanese photographer. Sonomama means "just as you are" or "natural state" in Japanese. He brought these amazing designer clothes from Comme des Garçons, Issey Miyake, etc. to the farmland in Japan and photographed them on regular people. They're so beautiful! I love the idea that clothing is democratic and can be for anyone. Who do you design for? Do you wear the clothes yourselves? N: I really do love that people of all ages can and are wearing our clothes! I want our pieces to be timeless, ageless, and genderless. I wear our clothes every day, even pieces from our first collection. J: We definitely don't design anything that we wouldn't personally wear, however, it has been fun to discover who our customer is through our brand’s development. Our demographic is definitely not specific to age or even gender, as women and even some men ages 20-70 wear our clothing, but share a certain lifestyle. Our customer appreciates beauty but wants to wear clothing that is thoughtful and inspired. Wearing our clothes gives them confidence and an artistic perspective. They are inspired by art, music, travel, and are open minded towards new ways of thinking. Who do you admire in the industry and hope to align your line with? N: Rei Kawakubo, Yohji Yamamoto, and Issey Miyake. I am also a big fan of Mona Kowalska of A Détacher and admire how she runs her business. Who do you admire outside of the industry? Why? J: I have recently been really inspired by Grant Achatz, head chef of Alinea in Chicago. His story is great and parallels that of any artist trying to constantly evolve as a creator and this challenge we have to continuously make things that no one has ever seen before. I highly recommend watching his story on Chef’s Table - it's also quite the tearjerker. If you weren't working together, as Wolcott : Takemoto, what would you be doing? N: I really don't know! I have worked as a stylist before and I really love doing that. If I could afford it, I would go back to school or maybe study abroad. I missed out on a real college experience because I went to a fashion school and our curriculum was so focused. I would love to learn more about the world outside of fashion. J: I haven't really thought about it but did have a landscaping job in college and it was one of the best jobs ever - mostly because of the two grandfatherly bosses that I had. I imagine it would be fun to design landscapes for a living.